For the brightest possible colours, it’s best to apply Plasti Dip Fluorescent Colours over a white base, preferably white Plasti Dip for optimum adhesion. 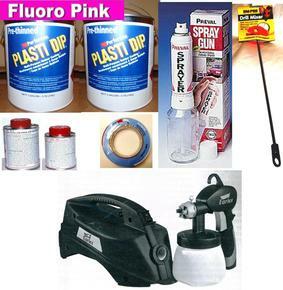 Due to their unique composition, fluorescent pigments like the ones used in Plasti Dip Fluorescent Colours tend to fade faster than other colours and some fading is inevitable. However, in most instances, quick touch ups as needed should be sufficient to keep Fluorescent colours bright. Customers are using this product to coat their wheel rims using the Preval Cordless Spray Unit or their own spray gun. We recommend 5-7 coats of Plasti Dip to get good coverage, this will make the Plasti Dip easier to peel off if/when required. You can download the Technical Data Sheet below for technical information and usage instructions. Pre-thinned Plasti Dip is ready for spraying. 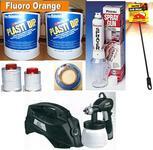 Wipe surface alcohol prior to applying Plasti Dip to ensure surface is clean. DO NOT USE PREPSOL. 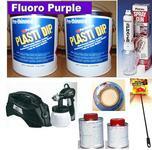 Stir frequently whilst spraying to stop separation of Plasti Dip and Thinners.